It’s something my late husband, Vincent, and I used to light-heartedly joke to each other whenever one of us messed up. “What Good Are You?” reflects our wacky, off-beat sense of humor. Of course, underneath it all was a foundation of appreciation and respect for each other. I happened to find this card, which I hand-rendered and gave to him in 1997. Today, I decided to dust it off and offer it as a greeting card to other people who want an opportunity to express to another person just how great they are, even if they are unsure about it themselves. As a hand-rendered card, I made the lettering disappear into the design. You have to search to read what it says. Then, once you figure it out, you do a double-take. 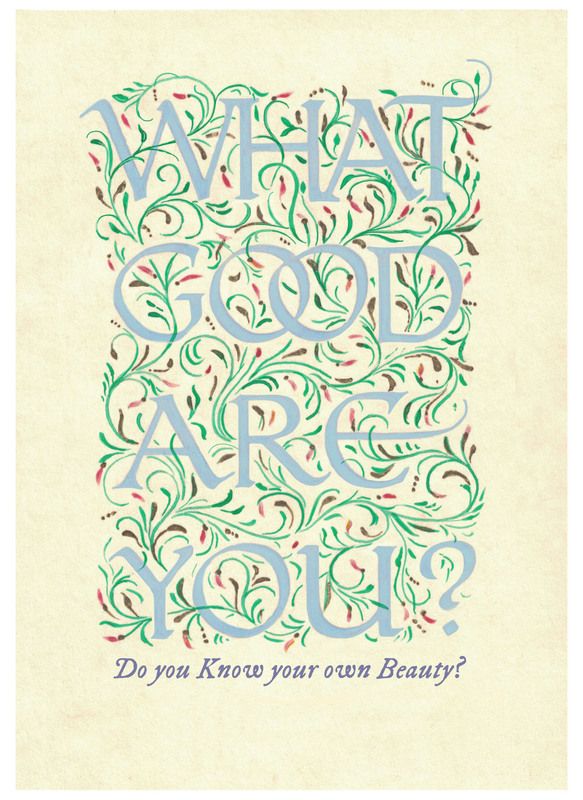 Do you know your own Beauty? Many people do not. They are clueless. Thus, I offer this Friendship Recognition card at my Zazzle store. This entry was posted in Calligraphy As Art, For the LOVE of LETTERS, New Illustrations and tagged Beauty, card, hand-rendered, illuminated, sense of humor, What Good Are You? on February 13, 2018 by Darlene.